The University of Georgia. Florida State University. The University of Kentucky. The United States Military Academy. The University of Louisville. Marshall University. The University of Oklahoma. To the average student, these are just a handful of potential destinations to map out a future. To the average college football fan, these are just a handful of powerhouses that dominate the gridiron year after year. 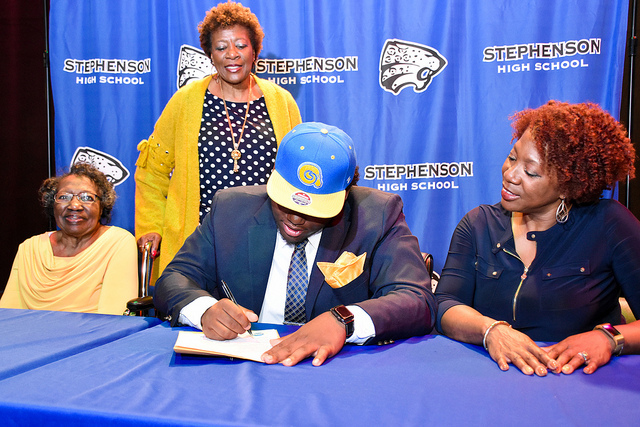 On Wednesday, February 6, these prestigious locales became destinations for several DeKalb County School District (DCSD) high school football players. Seventy-seven total DCSD football players signed letters of intent with athletics-based scholarships on February 6 as part of National Football Signing Day 2019. Twelve total high schools hosted ceremonies that included photo opportunities, official signings, and celebrations with friends and families. 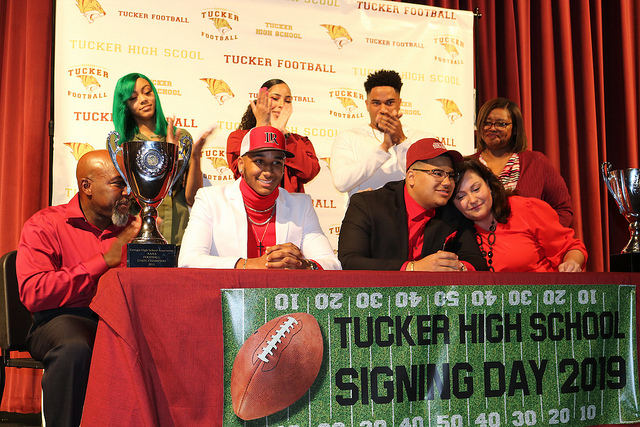 Tucker High School, who typically has at least 15 to 20 students participate in the event, hosted 12 students who signed letters of intent to various colleges and universities, marking the most for DCSD high schools in 2018-2019. Head Coach Bryan Lamar related the same sentiment to outgoing players on February 6 that he does every year: the long hard road to becoming a college football player has just begun. According to Lamar, about 1,086,702 football players play for a high school football team every year. Out of that number, about 91,000 get an opportunity to play college football on a scholarship, or just eight percent. From there, there’s just a 2.5 percent chance of going to a Division 1 football program; a 1.7 percent chance of going to a Division 2 program; a 2.3 percent chance of going to Division 3; a 0.8 percent chance of going to a NAIA (National Association of Intercollegiate Athletics) school; and a 1 percent chance of going to junior college. Following Tucker, Cedar Grove High School had the second most signings with 10—including widely sought-after Jaden Haselwood—followed by Miller Grove with nine, Columbia with eight, Arabia Mountain and Southwest DeKalb with seven, Stephenson with six, Martin Luther King Jr. with five, Dunwoody and Lithonia with four, Redan with three, McNair with two, and Clarkston with one. A complete list of signings with scholarships can be found below.